When you come to the gate, instead of the encampment beyond, the first thing you’ll notice is that there’s usually someone being either welcomed in, looking for help, or offering to help. Camp Second Chance is on the city-owned Myers Way Parcels, and while it’s been there, unauthorized, since last summer, it is also the site of one of the three “new” authorized-encampment locations formalized by a mayoral emergency order, approved by the City Council, last week. The original December announcement of those three locations (including one in Georgetown) marked a leap forward for a plan the mayor calls Bridging the Gap to Pathways Home. The camp is to be given a one-year lease, with the possibility of renewal for a second year. Three university students from South Africa, Zimbabwe, and Angola spent the morning in American Government classes at Chief Sealth International High School today. They are in Seattle as part of the Study of the US Institute for Student Leaders on Civic Engagement, sponsored by the U.S. Department of State Bureau of Educational and Cultural Affairs. They also visit Washington DC and New Orleans as part of the program. They are part of a group of 20 undergraduates from Angola, Botswana, Mozambique, South Africa, and Zimbabwe and are in the United States learning about civic engagement. They are participating in volunteer and service activities, leadership workshops, and cultural excursions. The program is coordinated locally by the Foundation for International Understanding Through Students. In the government classes this morning, they discussed the 2016 election, the U.S. criminal justice system and they compared and contrasted government structures and public education systems. They also listened to 12th grade students give a presentation on the Bill of Rights. Four months ago today, a three-alarm fire gutted one building at the Lam-Bow Apartments complex in Delridge. More than 40 people lost their homes; many stayed in a temporary shelter at Delridge Community Center until the Seattle Housing Authority found new places for them to live. The fire’s cause was never determined. During her appearance at this week’s “State of Delridge” community-group meeting in Highland Park (WSB coverage here), Councilmember Lisa Herbold was asked about plans for the charred building. That reminded us we had not followed up on it lately, so we took the question to SHA spokesperson Kerry Coughlin, who told us, “The building has been deemed unsalvageable. We will have to take it down completely. That much has been decided. What hasn’t yet been determined is what happens after that and when. We are still looking at options.” As for the demolition timeline, “We have submitted all the paperwork and fees to the City for the permit and are just waiting on that. As soon as we get it we will begin the work.” City files show, in fact, that the demolition-permit application for the building at 6955 Delridge Way SW went in just yesterday. That’s the question the current proposal for Mandatory Housing Affordability rezoning, as part of the city’s Housing Affordability and Livability Agenda, is supposed to address. But despite hundreds of properties proposed for rezoning, it could result in fewer than 100 affordable units over the next 20 years in the West Seattle Junction Urban Village, according to one part of the presentation seen by ~200 people last night, filling the upstairs hall at the Senior Center for a briefing, Q&A session, and small-group discussions of that area’s part of the plan. Other city staffers from OPCD were there, as well as a representative from the office of Councilmember Rob Johnson – who chairs the Planning, Land Use, and Zoning Committee through which the final proposals will go – District 1 Councilmember Lisa Herbold (observing rather than speaking), and consulting-firm employees who facilitated the small-group discussions. The presentation had a few points of customization for the West Seattle Junction area – including “retain(ing) highest density along the SW Alaska ‘transit spine’,” the “transition from (higher heights) to single-family areas,” and larger density increases near transit, stores, Fairmount Park. That brought the question that resurfaced at last week’s Junction Neighborhood Organization Land Use Committee meeting – what about waiting for rezoning until the station locations for Sound Transit 3 are known? There was no real answer to that, aside from the acknowledgement that it’s a unique issue for this area. That didn’t get to all the questions, and it was promised that they all will be answered on a TBA webpage. But that could take a month, the city reps acknowledged, when asked how long that would take, given that no summary of the December 7th open house – 7+ weeks ago – has turned up yet. Questions included how “infrastructure” is being addressed, including the need for more schools. The city is “working closely with Seattle Public Schools” as it plans for the BEX 5 ballot measure (followup to BEX 4, which built new schools including Genesee Hill and Arbor Heights Elementaries), reps said. And then there was the question of whether the “affordable housing” to be generated by MHA will “contribute to solving the homeless problem.” Staley’s response was that it’s “interrelated but not the same issue” – homelessness, he said, is caused partly by the cost of housing, and also by “other issues” (he did not elaborate). The Junction already has absorbed much more growth than was envisioned to have happened by now, so could some of the proposed growth be shifted to other areas of the city that have not? “That’s why we are out talking to people,” Staley replied. Around midway through the three-hour meeting, the small-group discussions began. People who had RSVPd were pre-assigned to certain tables, and more were added for those who had not – “there’s so much interest in your community,” the facilitator explained. COMMENT ONLINE: You can comment on any urban-village proposal at hala.consider.it. Or, you can e-mail comments to halainfo@seattle.gov. Something else you can do today – or any Thursday/ Friday/ Saturday/ Sunday afternoon, when the Log House Museum is open – go check out its ongoing project “Telling Our Westside Stories” exhibits. A reception at the museum last night celebrated both the culmination of the project and the involvement of both youth and elders in interviews done as part of it. In our photo above are Lola Demurger and Zoe Harper, 16-year-old West Seattle High School sophomores who were Madison Middle School students when they were part of the project. They’re talking with Seaview resident Detlev Kroll of West Seattle’s Kroll family, as in Kroll Map Company. Questions during their interview demonstration last night were largely about what had changed since he was their age. He recalled the Admiral Theater‘s single-screen days, and shops that used to be in the Morgan Junction area, including the old butcher shop at the corner of California/Graham (it was in this building demolished back in 2008). Curator Lissa Kramer emceed the reception. “Telling Our Westside Stories” includes exhibits themed “Land” (2012), “Work” (2014), and “Home” (2016). The program was funded in part by 4Culture. Regular hours at the Log House Museum are noon-4 pm Thursdays-Sundays. Tailgate has the throw back “TOYOTA” in black vinyl across it. The truck has a matching white cap on the bed, a large grey container on the roof which looks like a cargo box but is actually a Roof Top Tent (James Baroud Evo Space), an off road ARB bumper, black wheels, axiliary lights, CB radio antenna, Rino Rack Awning, and tinted windows. WHITE CENTER INVESTIGATION: Our partner site White Center Now is down right now (working on it) so we’re mentioning this here – King County Sheriff’s Office is investigating a possible stabbing in the 9900 block of 10th SW, and the Guardian One helicopter is or was assisting in the search, according to scanner discussion, which indicated the suspect and victim may be related. What a beautiful start to this Friday – a vivid pink sunrise. Thanks to everyone who sent and tweeted photos; we’re sharing a few along with today’s WSB West Seattle Event Calendar highlights here. OFFICE JUNCTION HAPPY HOUR: Fun finish to the 4th-anniversary week celebrations at coworking center West Seattle Office Junction (WSB sponsor) – you’re invited to Happy Hour, 4-6 pm. •	If you decide to join the best Coworking space in West Seattle on Friday, we’ll waive the $50 signup fee! HIGH-SCHOOL BASKETBALL: Seattle Lutheran High School has girls and boys varsity both at home (4100 SW Genesee) tonight, both vs. Pope John Paul II, 6 pm girls, 7:30 pm boys … Chief Sealth International High School (2600 SW Thistle) has girls and boys varsity playing at home tonight, both vs. Roosevelt, girls at 7 and boys at 8:30; West Seattle High School (3000 California SW) has girls varsity at home tonight, vs. Rainier Beach at 7:30. NIGHTTIME LOW-TIDE WALK: 9:30 pm at Constellation Park, meet Seattle Aquarium beach naturalists to explore the beach at low tide – details here. PREVIEW YOUR WEEKEND … via our complete calendar page. 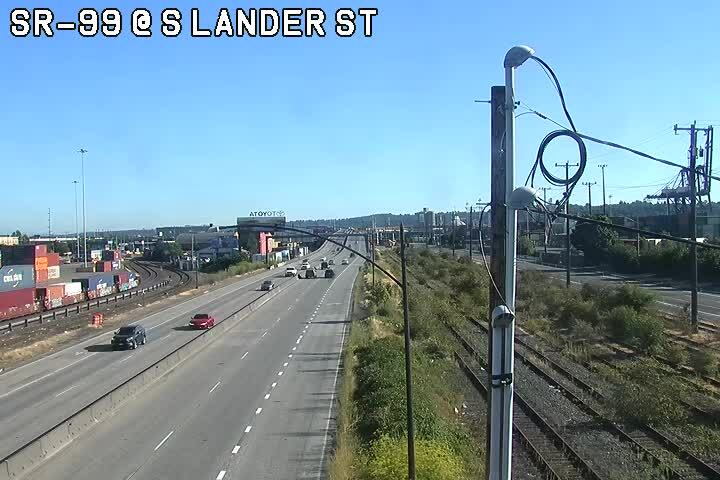 Drivers heading into downtown Seattle on northbound State Route 99 should plan for delays early Saturday morning. 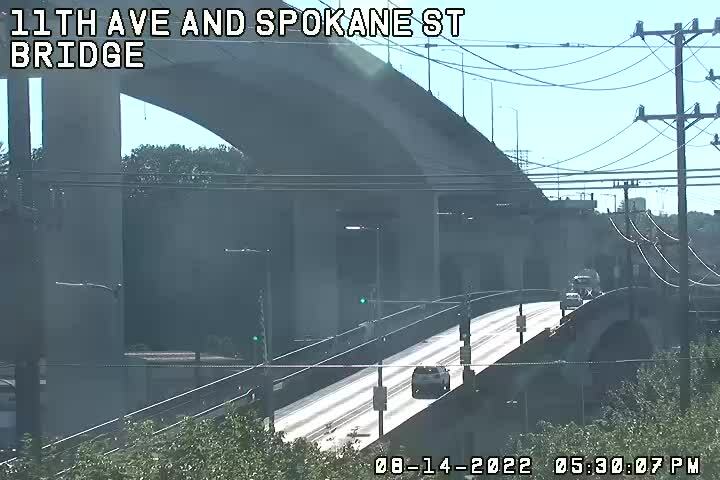 Washington State Department of Transportation bridge maintenance crews will close the three left lanes of northbound SR 99 on the 1st Avenue South Bridge at 1 a.m. Saturday, Jan. 28. All lanes will reopen by 8 a.m.
During this closure, crews will be conducting bridge grid deck repair work. One lane will remain open to traffic at all times. And thanks for the sunrise photos – we’ll include some in the daily preview. 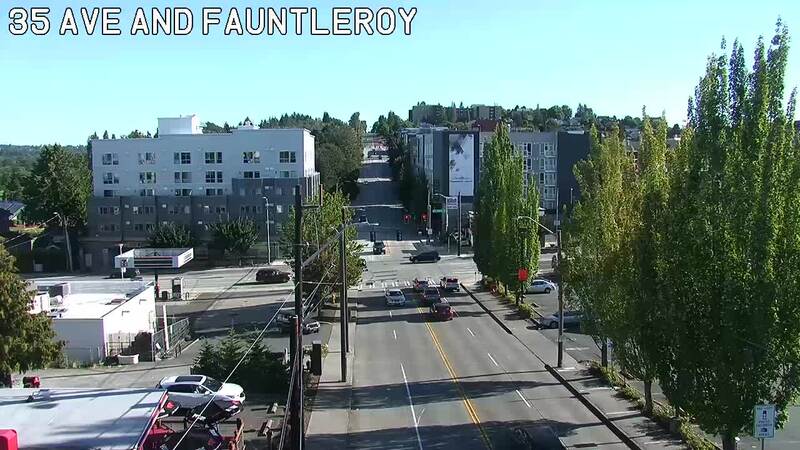 9:12 AM: We got a text a short time ago asking about what was logged as a medical call at Fauntleroy/Raymond before 7 am. No one texted or called while the call was still open so it wasn’t on our radar but we’ve just checked with SFD and they say one man was taken to the hospital after a call that was initially reported as a driver/bicyclist collision. 9:31 AM: If you’re heading out late – be advised, emergency crews have just been dispatched to an incident on NB 99 at Holgate. *The South Delridge Community Group, “organically formed in response to the many changes in our neighborhood.” SDCG usually meets on third Sundays and will resume that schedule in February. Highland Park Improvement Club. Besides being the site of the Triangle workshop, HPIC also on Saturday has a RainWise event happening, with a tree giveaway. North Delridge Neighborhood Council was represented too. Herbold first talked about the council’s passage of the new city budget and what’s in it for West Seattle and South Park (as she had recapped in her 2016 review). She also talked about the $29 million housing-money bond that she had told us was the biggest achievement of her first year. Another citywide program she mentioned – the “legacy business” program. And she mentioned the mayor’s recent decision not to fund the bicycle-share program, something she had previously been in the council minority in opposing. Safe Routes to School projects in this area might include Highland Park and Sanislo Elementaries. Also re: safety, the council “took a number of actions to fund new police officers” during the year, she noted.